During our research, we spent an endless time scrolling through booking engines and reviews. The larger and more touristy hotels were quite expensive. Plus, most of them sounded more like temples for the masses instead of an oasis to chill. In the end, we decided to rent an AirBnB in the center of Puerto de la Cruz. As it turned out, we discovered a real treat (apartment) not far from the ocean. 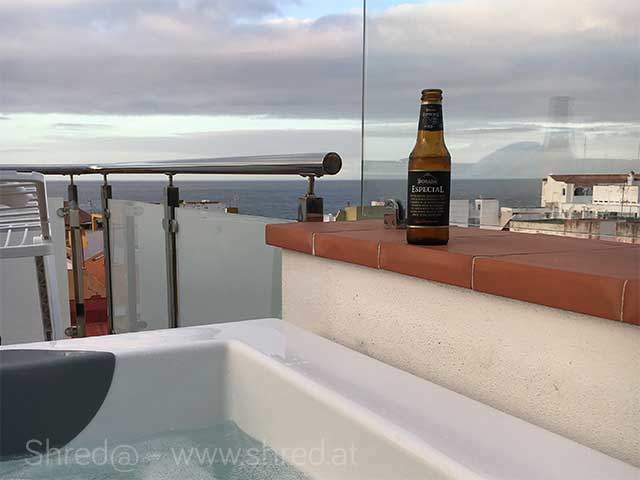 Jacuzzi on our roof terrace!…just saying. We decided to take it slow. I did not bring my Stumpy, since the plan was to work on our endurance (on the road) later in the week. Thus, we had booked our bikes and guiding with the BikeSpirit Team in advance. The first three days meant ‘all things Enduro’. Our guide Boris had picked some pretty nice trails for us and we were able to test the Giant Trance. We enjoyed a mixture of technical passages, switchbacks and the most rewarding panoramic views. When I look back, I guess the trail above ‘Bajamar’ (featured above in the header) was my favorite. The following three days, we stayed on the road. It was a nice change of movement and good for our muscles to recover a bit. We made some distance and were able to explore other parts of the island along the coast. From what we experienced, Puerto de la Cruz is a good starting point for road and mountain biking. In comparison to places in the south, it is quite urban and has some gems to discover when it comes to food. Since we stayed at an AirBnB, we tried to test a different restaurant every day. Our favorite was a small place ‘en la Calle de la Verdad’ called La Cocina. The food was excellent and the owners super friendly. We had a really nice time on Tenerife. If you already got the pleasure of riding some trails on La Palma, you will probably also like what you find here. Thumbs up!